VANCOUVER, BRITISH COLUMBIA--(Marketwired - Oct. 9, 2013) - Coro Mining Corp. ("Coro" or the "Company") (TSX:COP) is pleased to announce that its subsidiary, Minera Coro Chile Ltda. ("MCC") signed on October 4, 2013 an agreement with Minera Aurex (Chile) Limitada ("Aurex"), an indirect subsidiary of Freeport-McMoRan Copper & Gold Inc. ("Freeport"), whereby Aurex may exercise an option to acquire an interest in the Payen property. The property is located approximately 90km NNE of La Serena, 4km W of the Panamerican Highway and approximately 47km from the coast, in the III Region of Chile, at an elevation of 1,100m (Figure 1). Alan Stephens, President and CEO of Coro commented, "Payen has the potential to host a major copper-gold porphyry deposit, and we look forward to seeing the results of the Aurex exploration program over the coming years. Coro remains focussed on advancing its Berta heap leach copper project to production, in conjunction with its partner, ProPipe S.A., and in further exploring its exciting El Desesperado porphyry copper project, located in the Chuquicamata district." The large NE-SW oriented Pajonales alteration zone is located in the same 90-110 million year old belt of porphyry copper-gold deposits as Teck's Andacollo mine, Cemin's Dos Amigos mine, PanAust's Inca de Oro & Carmen projects and Hot Chili's Frontera project, which is located some 2.5km SE of the Payen property boundary. The Payen property is located in the Pajonales alteration zone, where it is at its widest, and where the alteration appears most intense. The northern end of the property is transected by a NW fault which has uplifted to the north and exposed a potassically altered and quartz stockworked diorite porphyry with associated copper-gold mineralization. This has been subjected to reverse circulation drilling carried out by the property owner in 2009, and diamond drilling completed by a private Chilean company in 2011-2012. Results of this drilling were summarized in the Company's news release of October 17th 2012. This mineralization is associated with a magnetic high anomaly, and Coro's exploration has shown that several other similar mag highs are present on the property, coinciding with outcropping mineralized diorite porphyry stocks. Much of the remainder of the property hosts extensive phyllic alteration with outcropping leached cap, quartz stockworking, remnant copper oxides, and associated magnetic low and copper geochemical anomalies. High sulphidation alteration, including phreatomagmatic breccias and silicified ledges with anomalous gold, indicative of a remnant lithocap are exposed at the highest elevations. Previous geochemical sampling has indicated the presence of strongly anomalous copper associated with certain areas of the phyllic alteration, which Coro believes have good potential to host chalcocite enrichment. Alan Stephens, FIMMM, President and CEO, of Coro Mining Corp, a geologist with more than 37 years of experience, and a Qualified Person for the purposes of NI 43-101, is responsible for the contents of this news release. The Company was founded with the goal of building a mining company focused on medium-sized base and precious metals deposits in Latin America. The Company intends to achieve this through the exploration for, and acquisition of, projects that can be developed and placed into production. 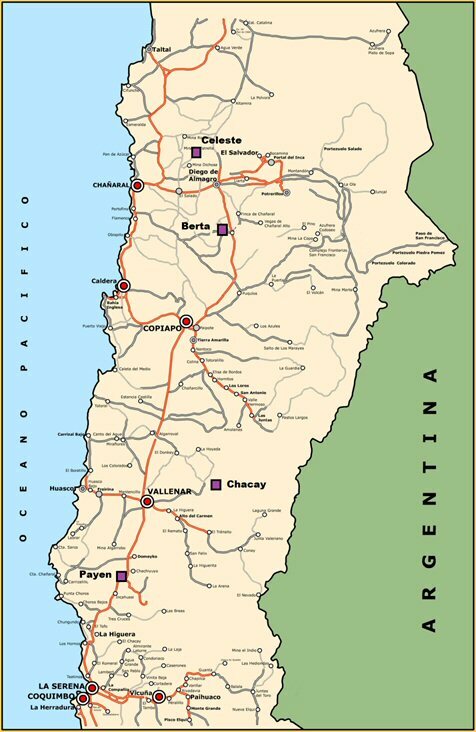 Coro's properties include the Berta, Payen, El Desesperado, Llancahue, and Celeste copper exploration properties located in Chile, and the advanced San Jorge copper-gold project, in Argentina. Earlier this year, Coro sold its Chacay property to a subsidiary of Teck for US$2,500,000 in cash plus a 1.5%NSR. This news release includes certain "forward-looking statements" under applicable Canadian securities legislation. Such forward-looking statements or information, including but not limited to those with respect to the prices of copper, estimated future production, estimated costs of future production, permitting time lines, involve known and unknown risks, uncertainties, and other factors which may cause the actual results, performance or achievements of the Company to be materially different from any future results, performance or achievements expressed or implied by such forward-looking statements or information. Such factors include, among others, the actual prices of copper, the factual results of current exploration, development and mining activities, changes in project parameters as plans continue to be evaluated, as well as those factors disclosed in the Company's documents filed from time to time with the securities regulators in the Provinces of British Columbia, Alberta, Saskatchewan, Manitoba, Ontario, New Brunswick, Nova Scotia, Prince Edward Island and Newfoundland and Labrador.